Father* Edward Allen Burkhalter Jr.
E-mail written 2004 from Jane Peyrouse, e-mail address. PECATONICA -- When S. L. Gillespie recently salvaged a damaged portrait from the attic of his family home in South Carolina, he brought it back to Rockford, hoping to have it restored. 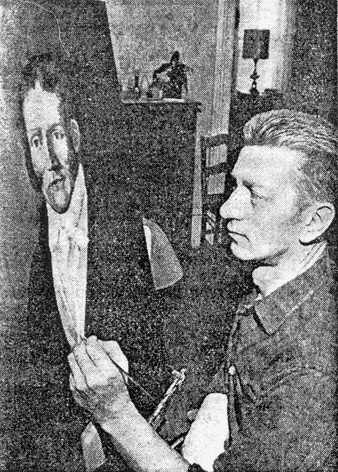 William J. Purnell, Pecatonica artist, accepted the challenge. The canvas apparently had been neglected for many years and required a great amount of research and work to achieve a satisfactory end result. According to a family Bible, the figure in the painting is that of James Gillespie, who lived in Cheraw, Marlboro County, South Carolina from 1754 to 1828. The Bible notations also state that it was painted by Thomas Sully (1783 - 1872) [note from William L. Gillespie: not true; not in Bible, probably not by Sully]. Sully, considered to be the last of the "American old masters," was a prominent English-born American artist, best noted for his portraits of Thomas Jefferson, Andrew Jackson, "Portrait of Eliza," and "The Torn Hat." He was a pupil of Gilbert Stuart, and finished Stuart's portrait of John Quincy Adams. During his career, Sully painted more than 2,500 portraits. "It is quite probable that he did the portrait of my ancestor during the early part of his career," Gillespie said. James Gillespie is a direct paternal ancestor of S. L. Gillespie, and it states in "A History of Marlboro County," that he served three terms in the state legislature. When Purnell received the masterpiece for restoration, it was in a great state of disrepair. "The entire background, clothing, and portions of the head were devoid of paint, except for minute areas which gave a clue as to color," Purnell related "The canvas was torn in areas." Purnell had the canvas removed from the stretcher and mounted on hardboard by a Rockford art shop. He then did a considerable amount of research on the original artist, so Sully's technique could be followed. Research on clothing worn by aristocracy of that era was also done, since the canvas was so badly deteriorated. In some places, only bare outlines visible. After research was completed and the canvas repaired, the task of actual painting started. "I worked on much of it through a magnifying glass in order to pick up colors of paint," Purnell said. "Only flecks of paint were showing in many areas. The features of the face were there, although the hair and sideburns on one side were missing. "Although the project entailed hours of research and painstaking work at the easel," he said, " I feel satisfied with the outcome. Considering that the original painting is almost 200 years old, it was a gratifying experience to restore it." Both Gillespie and Purnell are employed by the Woodward Governor Co., Gillespie in the research department and Purnell in publications as a professional artist. He is a graduate of the Layton School of Art, Milwaukee, and also teaches adult art classes at the YWCA in Rockford. from chart prepared by Caroline Lee Gillespie.